I once heard a story about a preacher who was invited to attend a men’s breakfast at a small Southern church in farm country. As they all set down, the visiting preacher asked one of the older farmers in attendance if he would say grace before they ate. The old farmer stood, and as everyone bowed their heads, he began by saying, “Lord, I hate buttermilk.” The preacher opened one eye and wondered to himself where this was going. Then the farmer loudly proclaimed, “Lord, I hate lard!” Now the preacher was overly worried. It’s the kind of made-from-scratch, fresh-baked biscuits I imagine being served at that small southern church that I enjoyed for breakfast this morning. 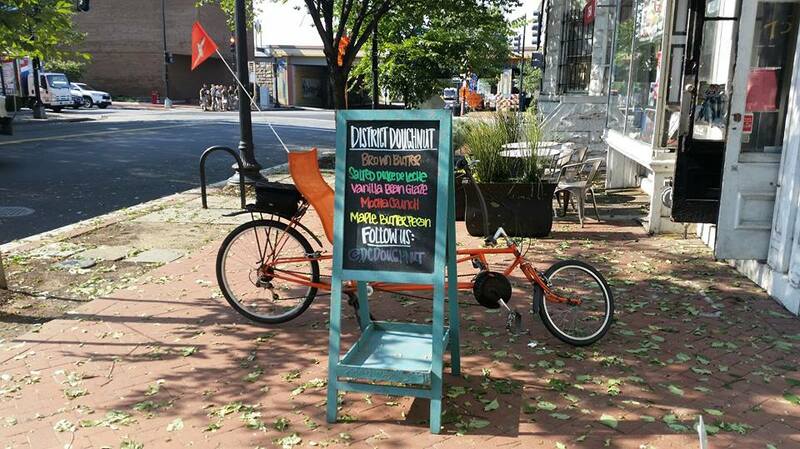 Instead of what is usually a lunchtime bike ride, today I went for a ride at the beginning of my workday so that I could have breakfast at the Mason Dixie Biscuit Co., located at 1819 7th Street (MAP) in northwest D.C.’s Shaw/Uptown neighborhood. Ayeshah Abuelhiga founded Mason Dixie Biscuits in the summer of 2014. 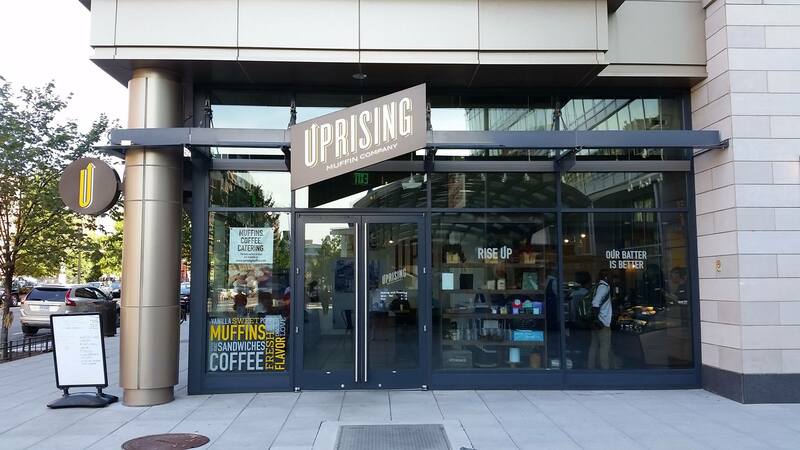 But what started then as neighborhood pop-ups quickly became a small but permanent stall at D.C.’s Union Market. Then, when loyal customers got tired of her small stall selling out of fresh biscuits by noon every day, she was inspired to expand and start selling frozen biscuits as well. It was at about this time that a marketing executive from Whole Foods Market bought some of her frozen biscuits at the stall at Union Market. 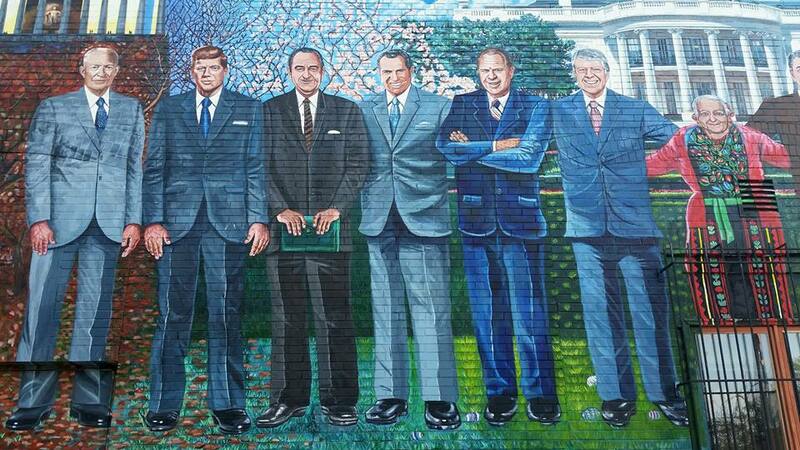 And the rest, as they say, is history. Ayeshah’s frozen biscuits gained nationwide fame when Mason Dixie Biscuits were launched at Whole Foods and other retailers regionally, and then across the country. The brand has since climbed the rankings to being one of the top frozen biscuit brands in the country. And their biscuits are now available in buttermilk, cheddar, sweet potato, and sweet corn. And there is a test kitchen in their restaurant for experimental biscuit flavors, so there my be more delicious flavors in the future. Mason Dixie Biscuits also opened its first of what hopefully will eventually be many restaurants, which is where I ate this morning. The restaurant serves up hearty biscuit sandwiches, juicy fried chicken, delectable Southern sides, and creamy frozen hand-spun milkshakes. And all of their offerings are made-to-order, using fresh, preservative-free, hormone-free, and high quality local ingredients. 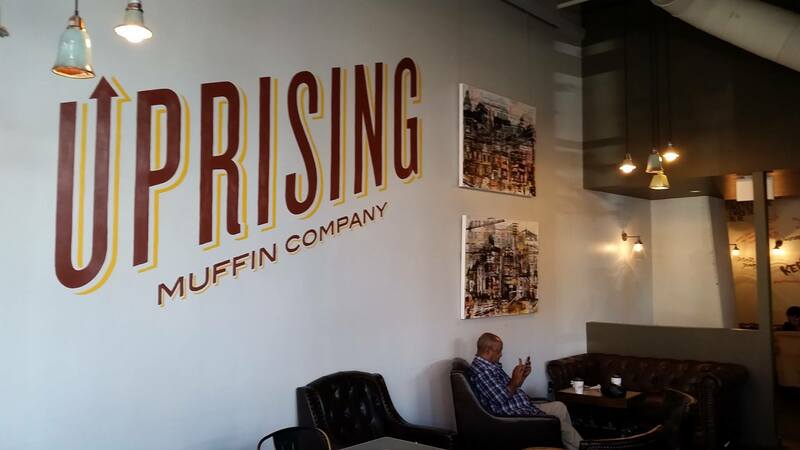 Their breakfast sandwiches and platters are available all day, everyday. 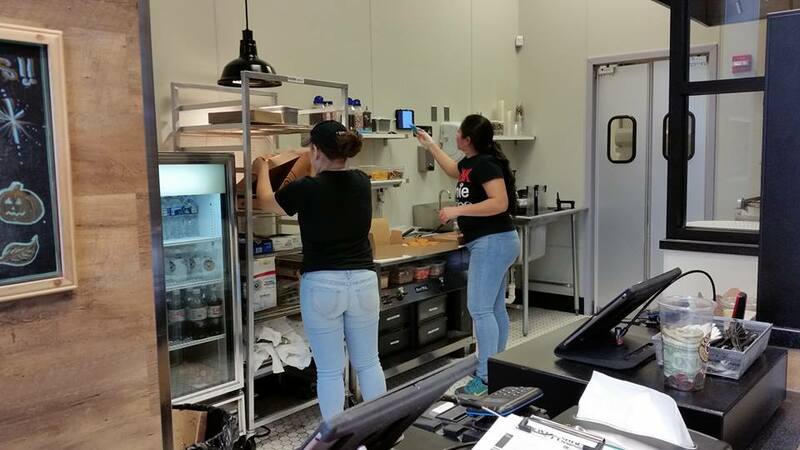 They similarly serve lunch items like chicken sandwiches and fried chicken platters, vegetarian sandwiches, and a variety of traditional sides. 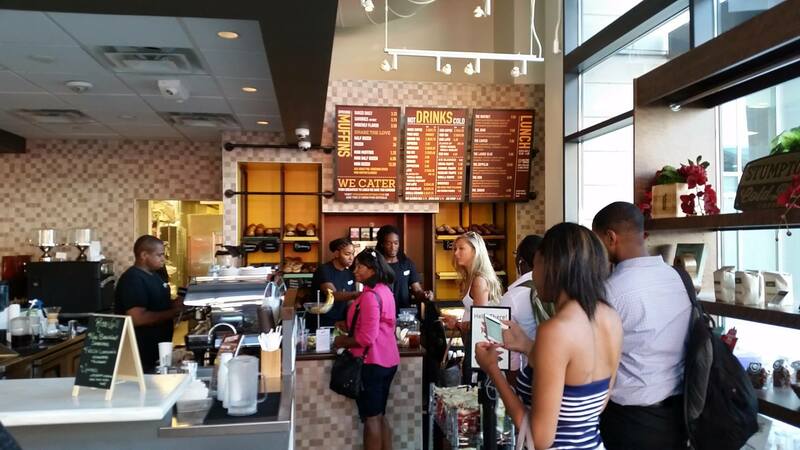 They also serve extras that include “sweet-tooth” sandwiches and “handspun” milkshakes. This morning I had a hard time deciding on what to order. I took a look at some of the orders other customers were having in an attempt to decide. But it was still difficult to choose between the different breakfast sandwiches and the available platters. I eventually opted for the xxxxx. But the only way I was able to convince myself to make a decision was to resolve myself then and there to go back again soon and try some of their other breakfast offerings. I also envision myself going back again and having lunch there too. Or to put it more accurately, going back multiple times to try different lunch menu items. On some afternoon once the weather gets warm, and can also imagine myself finding my way there to have a mid-afternoon snack of a chocolate-hazelnut-banana biscuit sandwich and a chocolate swirl milkshake. Or maybe a strawberry shortcake biscuit sandwich and a vanilla shake. The cherry and cookies and cream milkshakes look awfully good as well. I guess I’ll just have to keep going back over and over again. In the meantime, I think I’ll stop at a grocery store and stock up on their frozen biscuits to have at home. UPDATE: After thinking about them all day, I decided to get some biscuits at a local supermarket. So I checked using the company’s web site to see what store closest to me carries them. And since my daughter was going out anyway, I asked her to stop at that store and pick some up. But when she asked, the manager of the store said that they didn’t carry them. After she went out to her car to leave she remembered while she was still in the parking lot that she had forgotten something else. So she went back into the store. And when the manager saw her return he went up to her and apologized. He said they do carry Mason Dixie biscuits after all, but he didn’t realize his mistake until after she left. So to apologize to her, he gave her two packages of biscuits for free. So now I have both Mason Dixie buttermilk and cheddar biscuits in my freezer, and I can have them anytime. For a while when I initially started this blog, I would visit a restaurant on my last ride of each month and write a post about it. I haven’t done that as frequently during the past year. But I didn’t want 2016 to end without at least one more ride during which I treat myself to something better than the cafeteria fare I often eat at my desk after I get back from a bike ride. 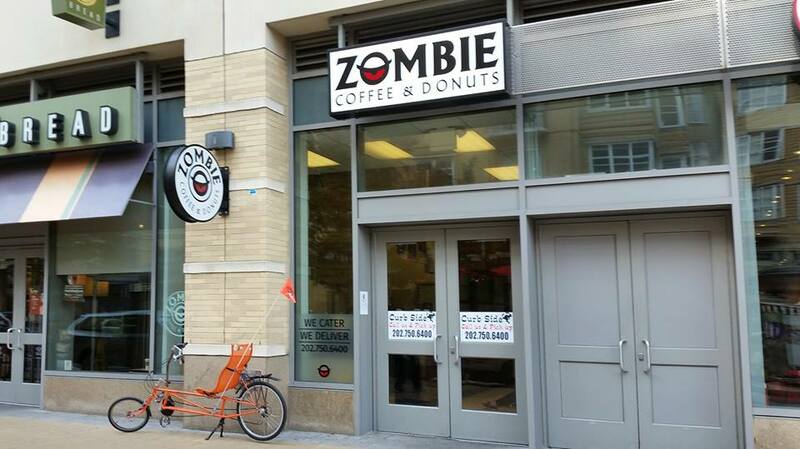 So on this bike ride I sought out Zombie Coffee and Donuts, one of the few local doughnut shops that I hadn’t been to previously. 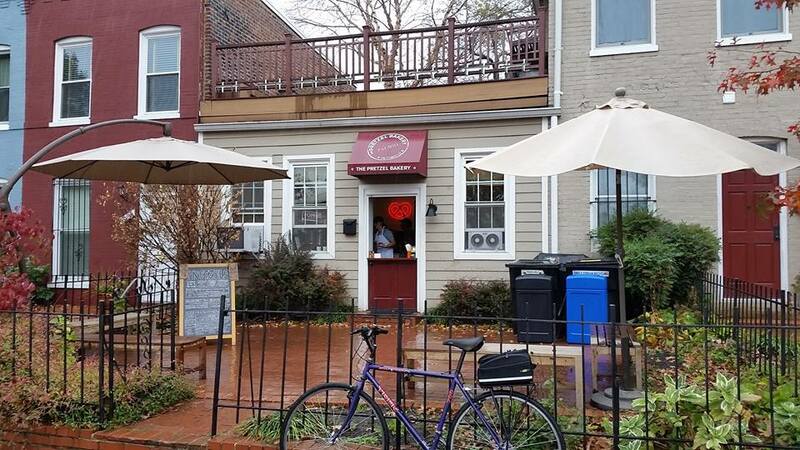 Zombie has two locations, and I chose the one located at 3100 14th Street (MAP) in northwest D.C.’s Columbia Heights neighborhood. I chose this location because the other is a little too far away for me to ride to on my break from work. Their only other location is in Athens, Georgia. Now, I’m not much of a coffee drinker. I never have been. I remember first trying it as a child and not liking it. My parents said I would learn to like it, but I decided it wasn’t worth learning to like. 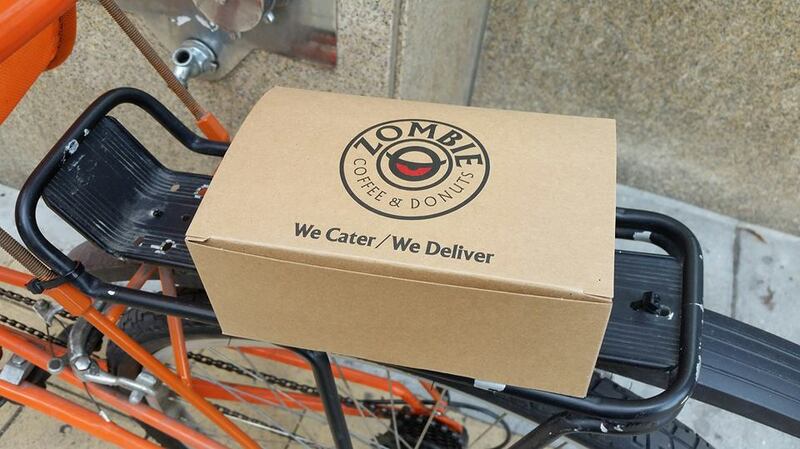 So on this bike ride I sought out Zombie not for the coffee but for their doughnuts. 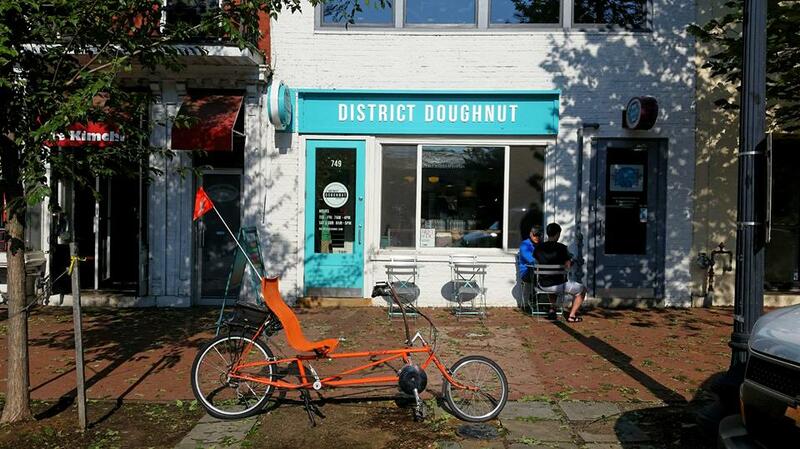 And you might be able to tell from some of my previous blog posts, I like a good doughnut. 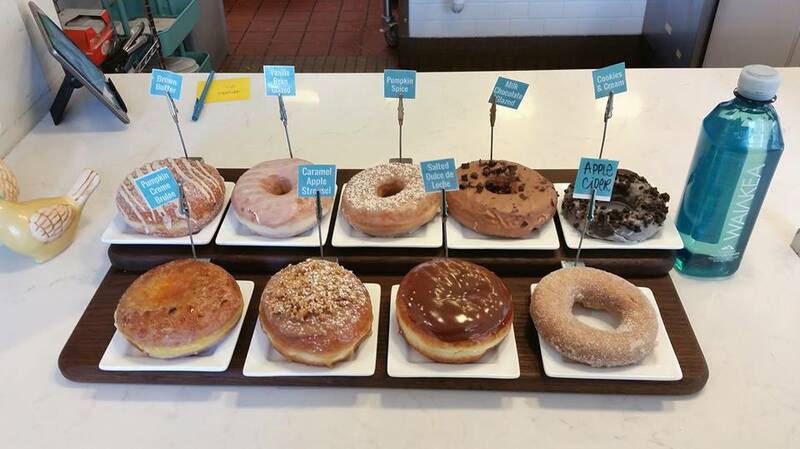 Zombie serves only fresh made-to-order cake doughnuts which can be topped with your of choice glazes and toppings. The way that it normally works is that after entering the shop you’re handed an order form that asks you to specify which kind of glaze you’d like with which topping. Some of their most popular combinations are listed at the top of the order form, and include Chocolate Icing and M&Ms, Vanilla Icing and crushed Oreos, Maple Icing and Bacon or Pecans, either Chocolate or Vanilla Icing and Caramel Drizzle, Lemon Glaze and Coconut, or Half Chocolate Icing and Half Vanilla Icing. 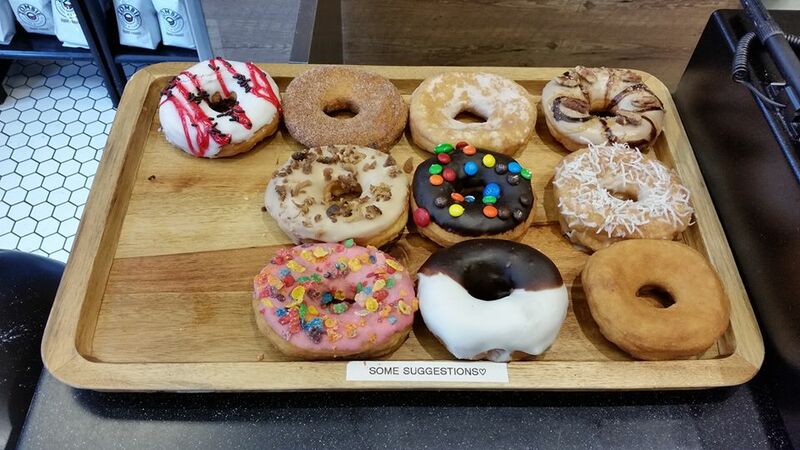 Or you can check off your own individual choices such strawberry glaze with rainbow sprinkles, as I’m sure Homer Simpson would order if he were at Zombie. Altogether there are 84 possible combinations of glazes and toppings. 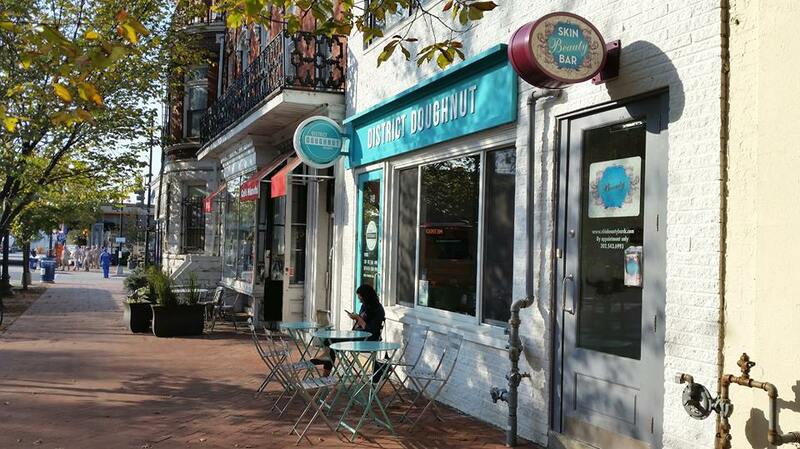 I happened to walk in at one of the infrequent times when there was not a line, so I was able to just tell them what kind of doughnuts I wanted, and they made them as I stood there. 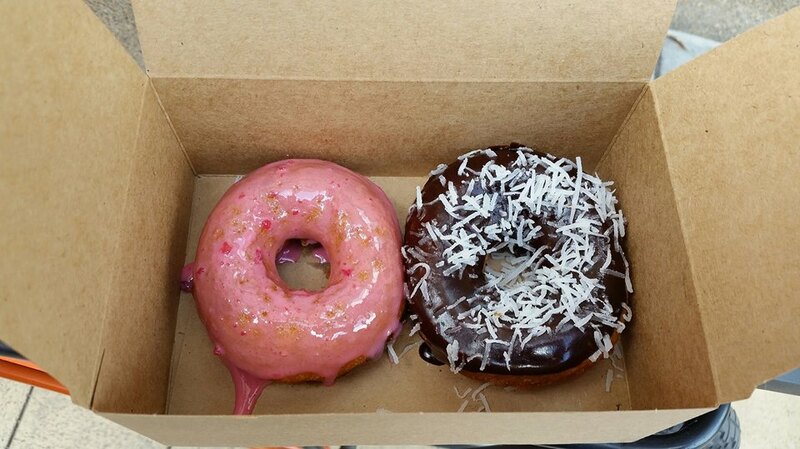 I chose one with just plain strawberry icing, and a chocolate iced doughnut with shredded coconut. Now I’m not going to “sugarcoat” things here. 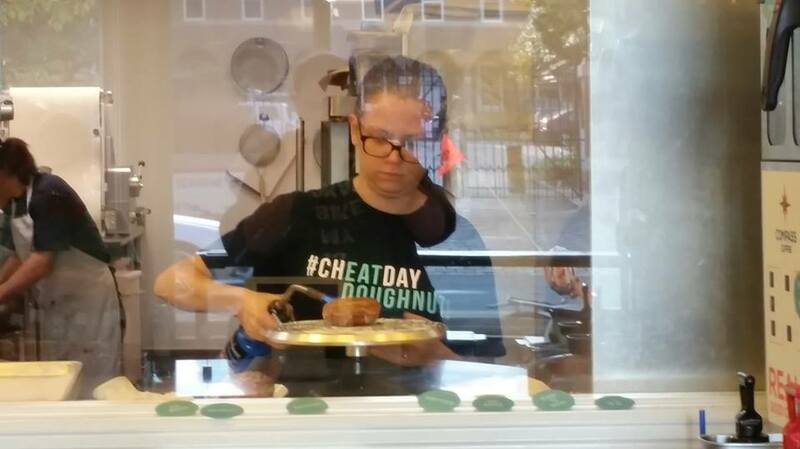 They were not the best doughnuts I’ve ever had. But they were so fresh they were still warm, and they were darned good. They’re so good, in fact, I can forgive them for spelling the word doughnut incorrectly. 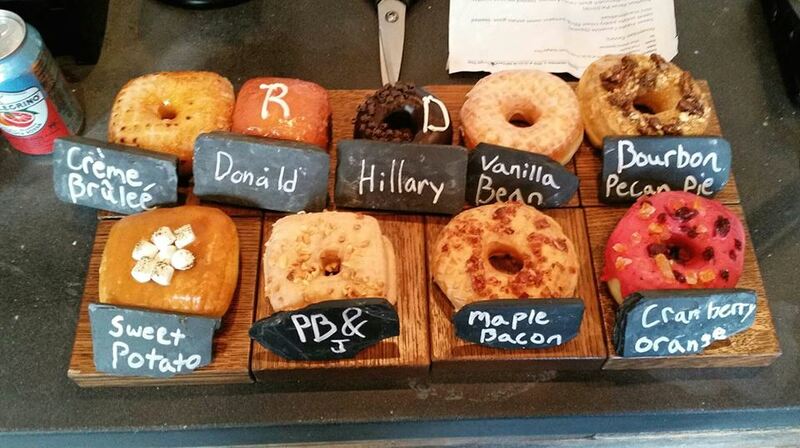 The new doughnuts reflect the tastes of the candidates for which they are named. The Donald is yeast doughnut filled with a delicious cherry compote and lightly coated with a vanilla-Cherry Coke glaze. The flavors were selected based on Mr. Trump’s reported love of both Diet Coke and cherry vanilla ice cream. The Hillary is a chocolate cake doughnut with a spicy-hot chocolate-Chipotle glaze. 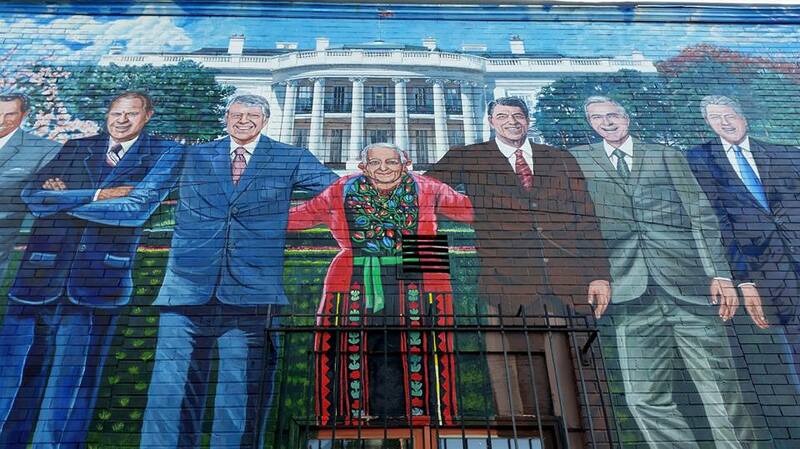 It was created based on Mrs. Clinton’s reported love for chocolate, and the fact that it has been reported that she eats a hot pepper every day. Both doughnuts are piped with vanilla icing lettering on top – an “R” for the Republican candidate, and a “D” for the Democratic candidate. However, if you are disenchanted with the two-party system or just can’t bring yourself to vote for either of the candidates representing the major political parties this time around, there are a variety of independent candidates for who you can cast a vote. They include Crème Brûlée, Vanilla Bean, Bourbon Pecan Pie, Sweet Potato, Peanut Butter and Jelly, Maple Bacon, and Cranberry Orange. The Donald and The Hillary doughnuts are only available until the election next Tuesday. 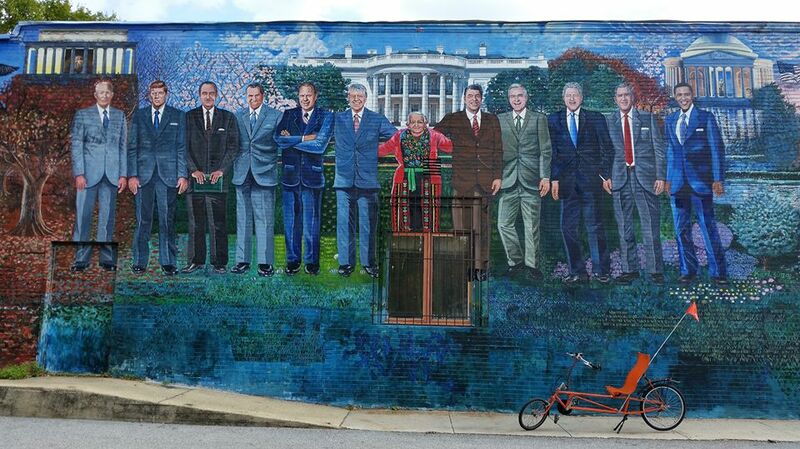 On today’s bike ride I stopped by and cast a vote. And with less than a week to go until the election, I recommend you hurry down to Astro and do the same. Or you can cast more than one vote if you like. 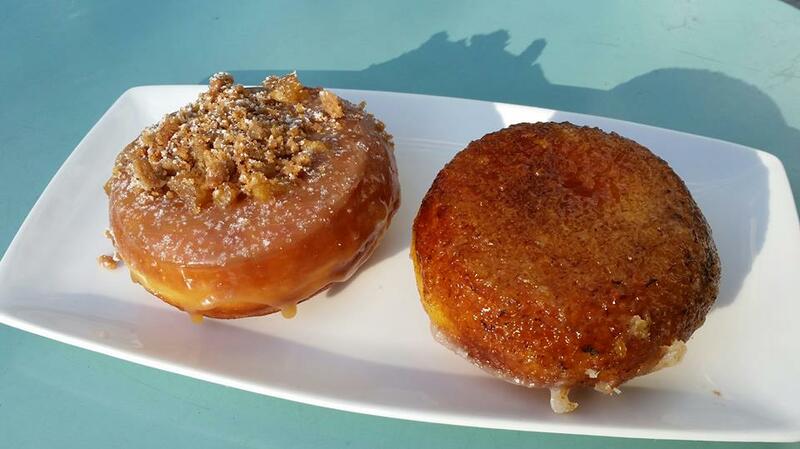 Because when it comes to these doughnuts, my recommendation is to vote early and vote often. This year the arrival of spring did not bring along with it the arrival of spring-like weather. In fact, on the first day of spring I was treated to sleet and snow flurries, and the weather has remained unseasonably cold for the past few days. So I decided thumb my nose at the weather’s refusal to adhere to a schedule, and have my favorite cold weather comfort food for lunch before the warmer weather is eventually ushered in. When I think of comfort food, I think of a grilled cheese sandwich and tomato soup. What has become my lifelong fondness for the comfort combo began as a child with Velveeta cheese on two slices of Wonder Bread and a can of Campbell’s Tomato Soup. As a grown-up my tastes have progressed, but a good grilled cheese sandwich with tomato soup can still make me feel as warm and secure as a little boy enjoying lunch in my Mom’s kitchen after playing in the snow. 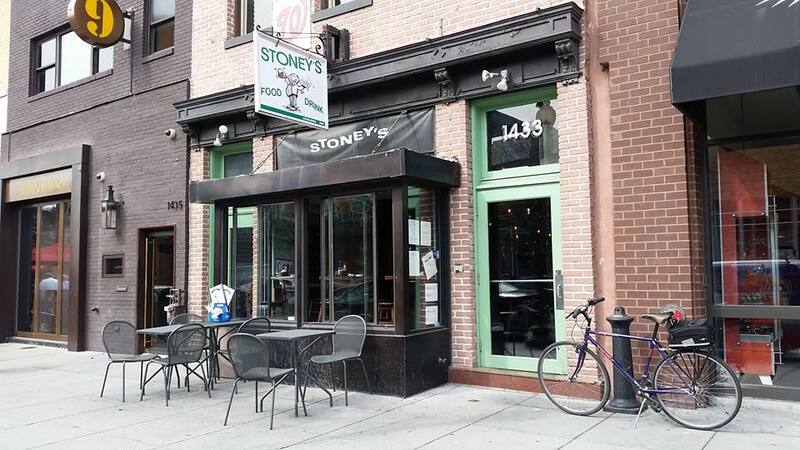 Nowadays when I want to go out for a good grilled cheese sandwich and tomato soup, I think of Stoney’s Bar and Grill, a tin-ceilinged dive bar located at 1433 P Street (MAP), in northwest D.C.’s Logan Circle neighborhood. 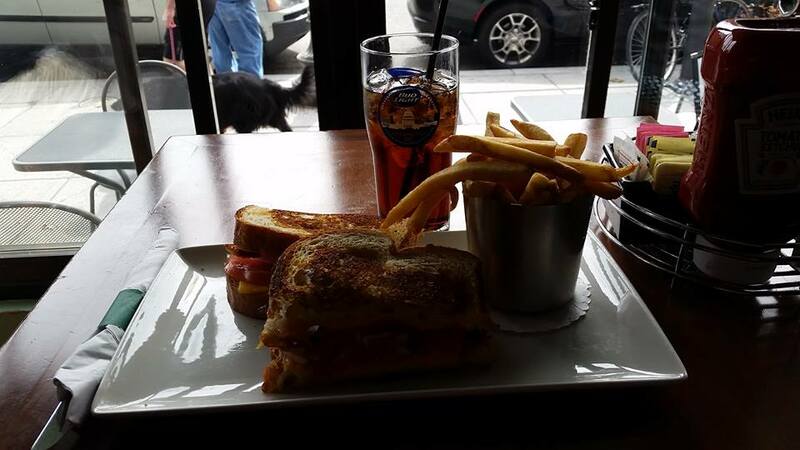 Famous for their version, Stoney’s is consistently voted one of the city’s best places for grilled cheese in The Washington Post’s annual reader’s poll, and on consumer –driven apps such as Yelp and Foursquare. I attribute its popularity to owner Tony Harris preference for bulk American cheese over thinner, pre-sliced varieties. 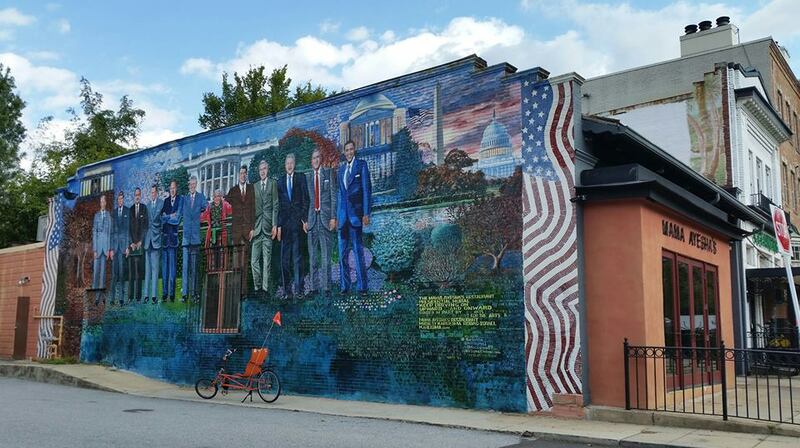 So I braved today’s unseasonably cold weather and made Stoney’s the destination of my lunchtime bike ride. 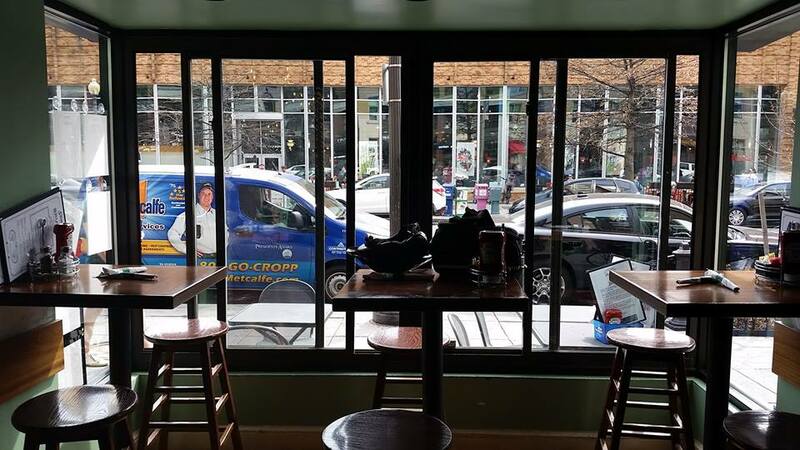 I walked into the dark, no frills joint, and was happy to be able to get a seat in the front window, which is usually one of my favorite spots to sit in a restaurant. Sitting in a restaurant’s front window often allows me to enjoy the show passing by on the sidewalk out front as I enjoy my meal. 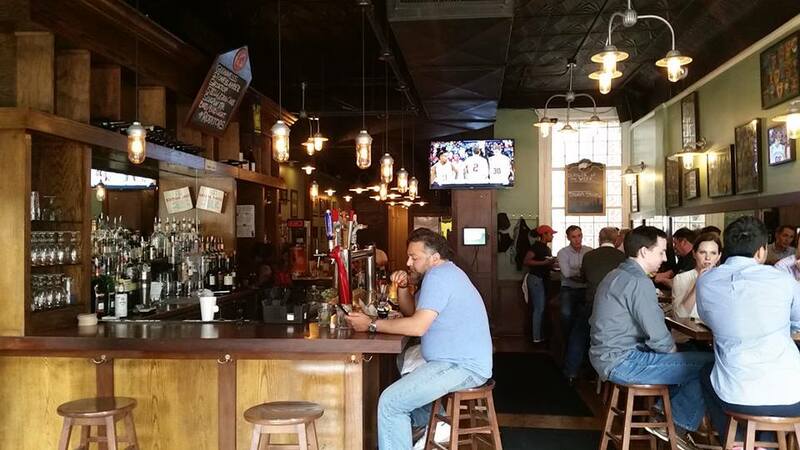 I was greeted right away by both the bartender and one of the waitresses, which instantly made me feel at home. I then ordered what I came for, a grilled cheese sandwich. Well, I actually splurged and ordered the Super Grilled Cheese. The Super is a delicious combination of their regular sandwich, consisting of thick-cut American cheese on farmhouse white bread, but with fresh tomato, red onion and bacon added. Combined with thick-cut fries and a cup of their Roasted Tomato Basil Soup, it was good enough to hope the winter weather lasts a little longer. Unfortunately, the photo of my lunch came out dark and fails to show how appetizing the sandwich actually was. I guess to correct that I’ll just have to go back to Stoney’s and order it again soon. For the sake of this blog that is something I am willing to do. It seemed like an unusually long morning at work, so despite the fact that it was pouring down rain by the time I was ready for my lunch break, I went for a bike ride anyway. After the first few minutes I was thoroughly soaked. So I quickly got past worrying about getting wet, and was able to enjoy the ride. 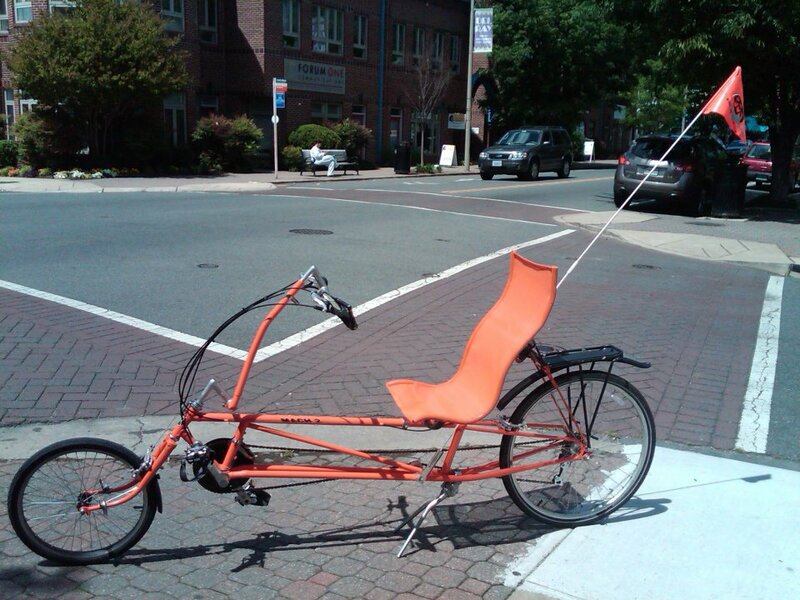 In fact, it was so much fun that I used a little vacation time and took a longer than usual ride. Near the end of the ride I stopped at a new place, or at least one that was new to me, named The Pretzel Bakery. 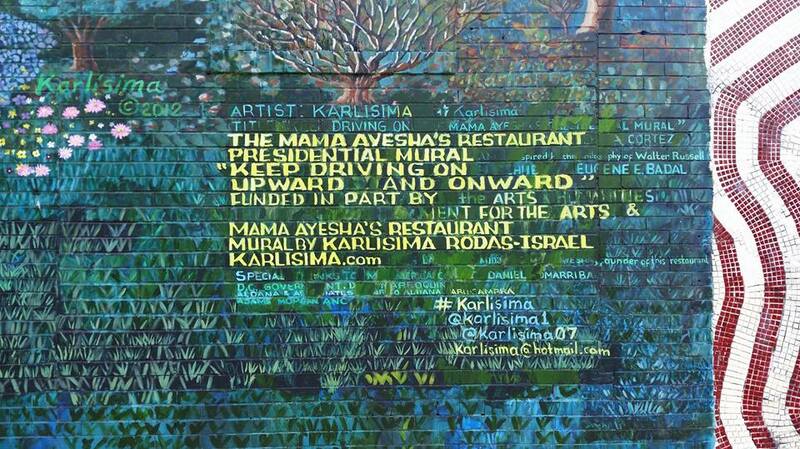 It is located at 340 15th Street, Southeast (MAP), in D.C.’s Capitol Hill neighborhood, on a block of small but tidy row houses, and across the street from Payne Elementary School. The Pretzel Bakery serves hand-rolled, Philadelphia-style soft pretzels, and they make them in small batches so you can get them fresh-out-of-the-oven throughout the day. 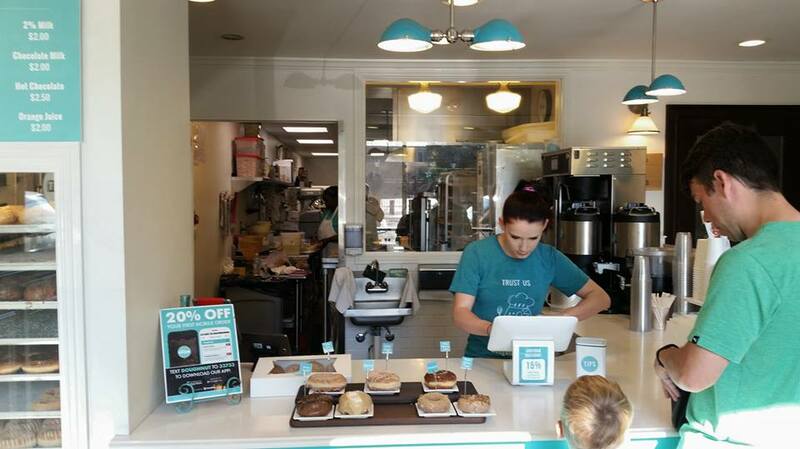 The Pretzel Bakery is owned and run by Sean Haney, who opened the small neighborhood shop after he got frustrated with the lack of the quality pretzels he had grown up enjoying in Philadelphia. After years of perfecting his Pennsylvania Dutch-style recipe, he began providing Washingtonians with a quality alternative to the mass-produced pretzels available at mall chain stores and the heated up frozen pretzels served by some local restaurants. What distinguishes pretzels at The Pretzel Bakery from others is that they don’t coat the dough with butter before browning them in an oven. 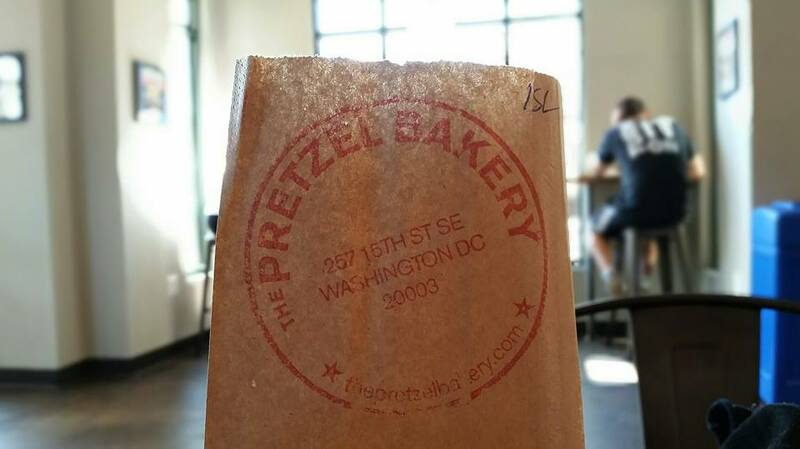 Instead, The Pretzel Bakery briefly boils the made-from-scratch dough, much like an authentic New York bagel, resulting in a chewy texture and a more flavorful pretzel. 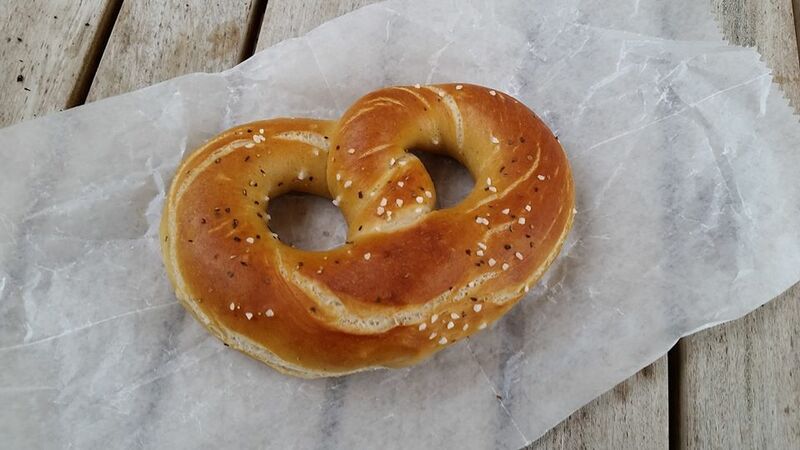 The menu includes the original Salted pretzel; the Everything, which is topped with poppy seeds, sesame seeds, onion, garlic, and salt, as well as; a cinnamon-glazed pretzel with a kiss of salt, named the Sweet. They also have something called Pretzel Bombs, which are Nutella-filled Sweet pretzel rolls. 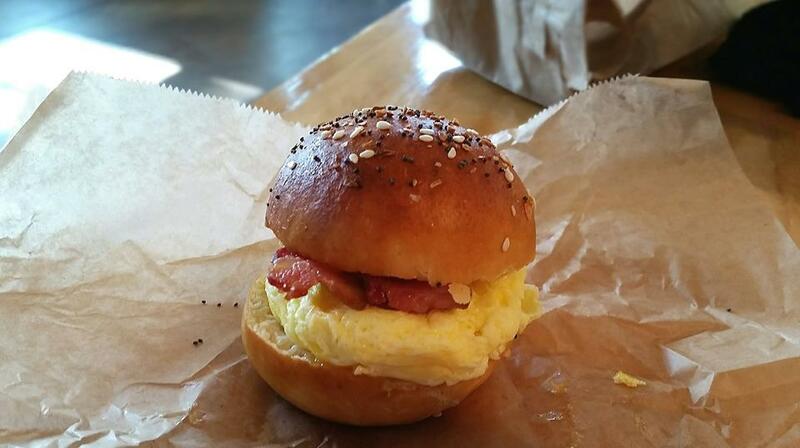 And for breakfast, they offer a Breakfast Slider, a bacon, egg and cheese sandwich on an Everything pretzel roll, which was recently voted “Best Breakfast Sandwich” in D.C. by The City Paper. I haven’t had one yet, but you can bet I’ll going back in the morning sometime soon to try one (or more). Today, however, I was fortunate enough to be able to get one of their limited seasonal offerings. I got a couple of fresh-baked and still warm Pumpkin IPA Pretzels, and ate one with some ice tea under one of the large umbrellas on the patio in front. I took the second one back to the office with me and enjoyed it there. They offer mustards and dips, including Gulden’s Spicy Brown and French’s Yellow, as well as Caramel Mustard, Whole Grain Mustard, Nutella, and Philadelphia Cream Cheese. But my pretzel was so good that I decided it didn’t need anything added to it that might take away from its flavorful goodness. I haven’t done a restaurant review here on this blog in a while. And when I do a restaurant review, it is usually at the end of the month. But as a fan of soft pretzels, and an even bigger fan of pumpkin anything, I just couldn’t wait until the end of the month to give this place a try. And I’m glad I didn’t. 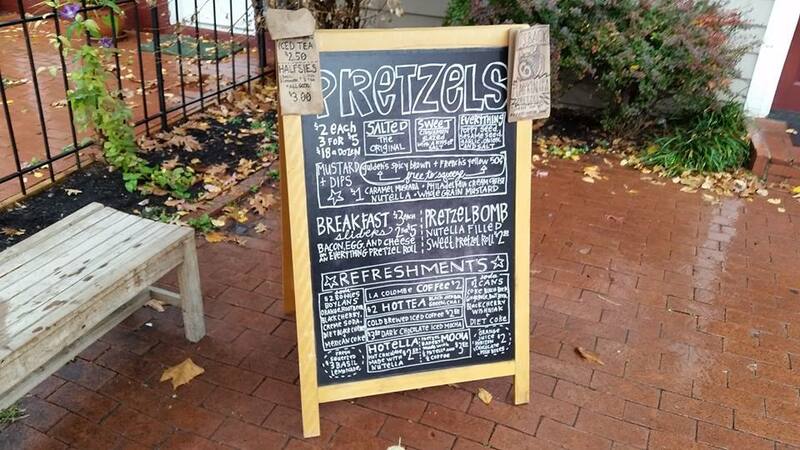 Their pretzels are so good they’re worth getting soaking wet while riding on a bike in the rain just to get there. But, of course, you can get there any way you choose. 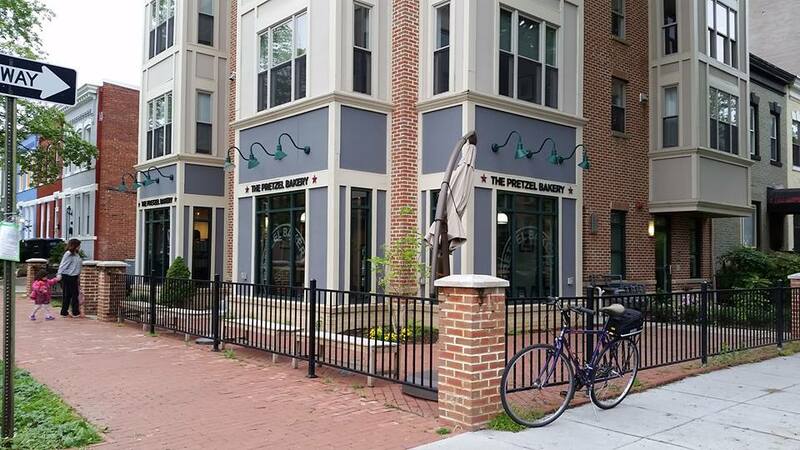 UPDATE: The bad news is that On March 2, 2016, The Pretzel Bakery moved. 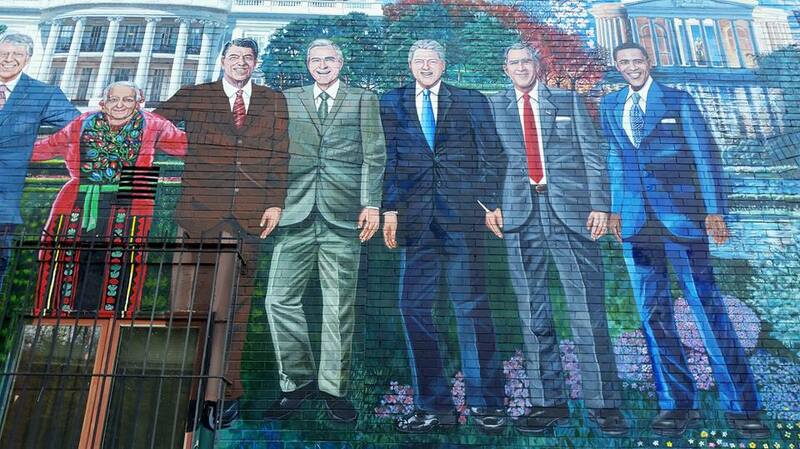 The good news is that they only moved down the street, to 257 15th Street. 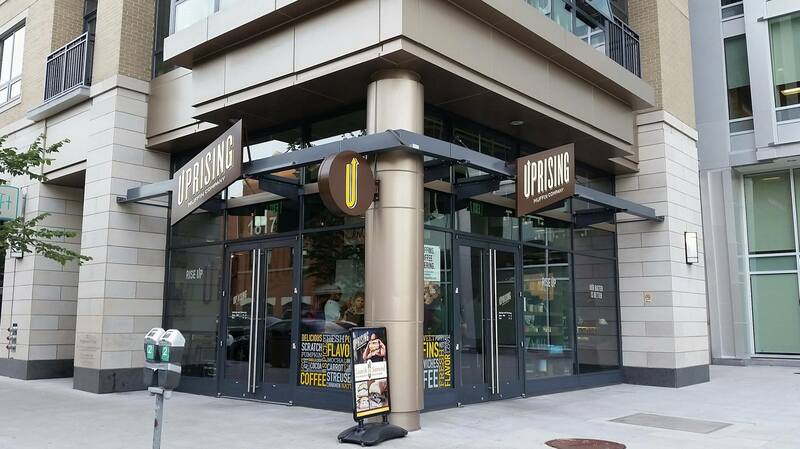 And you can still enjoy their full menu, along with intermittently added special offerings such as Pretzel Dog Saturdays, in their new, larger location.